St Ives Cornwall UK- the town that has everything! A picturesque harbour area, five beaches and an abundance of cafes, restaurants, shops and galleries. Famous for art, St Ives Cornwall has a real cosmopolitan feel on summer evenings when the shops are open late and the smells of the many culinary delights fill the air. 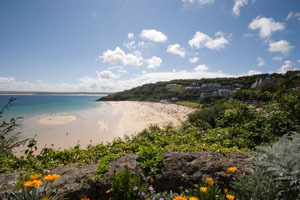 St Ives has lots of accommodation to choose from including hotels, B and Bs, Cottages and campsite. View list of accommodation in St Ives Cornwall. There are lots of places to eat in St Ives including many good restaurants, cafes, pubs, take aways and fish and chips. View list of places to eat in St Ives. Riviere Sands Holiday Park is just across the bay from St Ives and has a good choice of accommodation, excellent facilities and beautiful views - an ideal spot for your self catering holiday in Cornwall. St Ives has lots of winding cobbled streets edged with old fisherman's cottages to explore. There are five different beaches in St Ives Cornwall, each with a very different feel and all accessible by foot from the town centre. There is Porthminster Beach, a large expanse of golden Cornish sand which usually has a calm sea and is lifeguarded in the summer season. The harbour beach in the centre of St Ives, a small beach on the side of the harbour. Porthgwidden beach St Ives, a small cove with golden sands. The famous surfing beach of Porthmeor, lifeguarded in summer. Lastly a small beach between the harbour and Porthgwidden - the only beach which is dog friendly all year. More information about St Ives Beaches. Due to the special light around St Ives the town has been an artists haven for almost 100 years. Many famous names have been association with St Ives, Alfred Wallis, Terry Frost, Sickert, Whistler and new St Ives artists are immerging all the time. The famous Tate Gallery (marked on the map of St Ives below) stands majestically on Porthmeor beach and holds varied art exhibitions. The Tate Gallery St Ives building itself is an architectural delight, particularly the view from the large windows. The Barbara Hepworth sculpture garden is definitely worth looking at. More information on St Ives Artists and St Ives Galleries. St Ives has an interesting town museum which sets out the history of St Ives Cornwall. If you are lucky you will see the friendly St Ives seal that comes to say hello and watch passers by - usually at the seaward side of the harbour wall. Or, why not see the seals closer up with a seal watching boat trip from St Ives harbour around seal island or St Ives Bay with St Ives Boats. St Ives Boats also run fishing trips or for that very special holiday outing you could privately charter the boat. A last comment on St Ives Cornwall BEWARE OF THE SEAGULLS! Do not underestimate their strength, wit and cunningness when it comes to stealing food. They are vicious. Please Please do not encourage them to take food from humans by feeding them. DO NOT FEED THE SEAGULLS! Guard your food and let them catch their own in the sea. There really is something for everyone at St Ives Cornwall, a popular place with surfers, families, beach goers, art lovers, artists and photographers. View photographs of St Ives Cornwall. Read more information about St Ives Cornwall. Eating out in St Ives, there are lots of places to eat out in St Ives Cornwall, from fabulous seafood restaurants, traditional pubs, cafes, bistros and the seaside favourite fish and chips. More information and details about eating out in St Ives. Accommodation St Ives, there is a variety of accommodation in St Ives Cornwall including hotels, B & Bs, Cornish holiday cottages and holiday parks close by. See list with details of Accommodation in St Ives. Porthgwidden Beach St Ives is a beautiful little cove backed by beach huts and the Porthgwidden Cafe. Read	more	about St Ives Beaches. St Ives overlooks the nearby Cornish beaches of Gwithian and Godrevy which are excellent to explore. Read more about Gwithian and Godrevy Cornwall. Read more about Cornish art view ONLINE GALLERY and see a list of Galleries in Cornwall including descriptions in our Art in Cornwall section. View our Cornwall Dog Guide for more information on dogs in Cornwall including pet friendly accommodation, places to eat with dogs and days out. Cornwall Dog Guide. Cornwall is such a romantic and beautiful place - ideal for a Cornish wedding with the sea as a back drop. See our guide to Getting Married in Cornwall.